On Friday night, Belle and Bad Boy took the opportunity to visit the NC State Fair. It had been five years since Belle first introduced me to this annual event. Unsuspectingly, this year’s visit brought back memories of my childhood. Growing up in an isolated community, a small island some 30 miles north of Key West, Florida, I was seldom exposed to outside influences. With no television, and only spotty radio coverage, the small Monroe County Fair was one of the few opportunities for exposure to the outside world that I was certain would disclose itself to me someday. Our visits to the fair were often anticipated for months before the event. My small group of friends and I would discuss the previous year’s event, and wondered what up-coming exhibits, rides and people would delight and intrigue us. After reaching young adulthood, and having traveled much throughout the Western Hemisphere, I no longer felt that the small county fair had anything to offer other than an amusing diversion. Looking back, however, I am certain its presence played a vital role in connecting me with the outside world and all its wonders. Were my annual visits to this small, quaint county fair during my impressionable years responsible for the person I became later? Perhaps. What is significant is the fact my most recent visit made me question my youthful inspiration to travel and explore other cultures. The NC State Fair is vastly more inspirational than the small county event of my childhood. It isn’t fair to compare the two events, except to say both events can serve as inspiration for young developing minds and imagination…but enough about nostalgia! 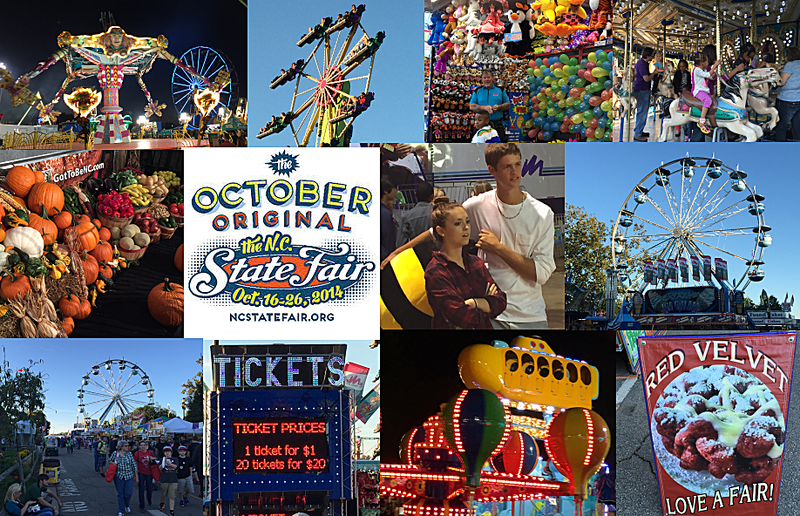 The NC State Fair combines all the traditional elements; exhibits, rides, games, music and food, just to mention a few, with a festival backdrop to enjoy them all at once. Belle and I started our visit with a red velvet funnel cake, a traditional “fair food”, and then began our walk-about to take in all the State Fair had to offer. In the exhibit halls we saw the award winning watermelon and pumpkin, along with prized livestock and 4-H exhibits. To make sure we didn’t miss all the NC State Fair had to offer, Belle and I strolled through the Midway with its bright lights, barker’s and rides before leaving. This festival atmosphere continues for an exhausting 10 days, giving everyone in the state an opportunity to participate. It will close on Sunday night, October 26th. I encourage everyone to take time out of their busy schedule to reunite with their youth, or take your children/grandchildren and perhaps help them to start a lifelong tradition, while becoming inspired through societal contact with something other than a device. Stay inspired my friends! Bad Boy.